One of our regular "Photo Library" crew - Bob Belletzkie - does more than just help catalog the NHRHTA's photo collection on Thursday nights, he has a wonderful website that's a treasure trove of information on the New Haven Railroad. He's also a retired librarian, professional researcher and all-around great guy. He wrote one of the first NHRR-related articles I ever read (covering the New Haven & Derby RR) and set the standard, in my mind, for well-written & well-researched railroad history. So it was a real treat when I finally got to meet him in person and I'm flattered that he takes the time to help out on Thursdays and give us the benefit of his knowledge and vast resources. But we're not the only ones he helps out - he assists in the cataloging of other collections as well. And sometimes, he comes across something he knows I'll be interested in. Case in point: the photo above. "East Haddam local frt New London to East Haddam via Saybrook Eng 363 5/46"
I'm not sure whether this train is eastbound or westbound through Waterford, but the notation leads us to believe that it's westbound, leaving New London and heading toward Old Saybrook (and, um, on to East Haddam, apparently). I've covered class K-1d mogul #363 elsewhere and it's clear from the records I have - as well as the photos I've discovered - that this engine was the typical power for this job until dieselization. What's not typical - and a little surprising to me - is the number of hoppers in this consist. I'm not sure if they're empty or loaded, but either way, I know of no industry on the southern end of the Valley line that would require these cars. While nowadays there's a stone and asphalt plant in Old Saybrook, east of the station, I can find no evidence that it existed anywhere near my era. So the cars are a mystery. . . If anybody can shed any more light on this photo - eastbound vs. westbound, what the hoppers were for, etc - leave a comment. And thanks again to Bob for providing this intriguing image. Clue as to direction might be which side of the tracks the telephone poles were usually found on. North side means this should be a west bound. I'm going to agree with Randy on this one, though why so many in one train is an interesting question. Stockpiling for the winter (no leaves on trees)? The first car is a fishbelly ribbed hopper (CNJ, WM, Reading...) as is the 6th, and there are 3 offset hoppers as well. None of these are New Haven type cars, but all fairly common in the anthracite regions. To add to theinterest, it sure looks like the first "house car" behind the hoppers is a meat reefer! Makes for an interesting train! Anthricite coal,in multi car lots would be unusual. Most coal dealers of the were small local companies and received 1 0r 2 cars. Also, coal hoppers were then used to spread ballast. They could be empty bituminous coal hopers from industry(s) in the New London area. Finally, a quarry once operated at the west end of Midway. Keep in mind that those hoppers could be destined for anywhere on the entire run of the local, not just the Valley Line. In New Britain alone at the time there were at least a dozen coal dealers receiving anthracite. 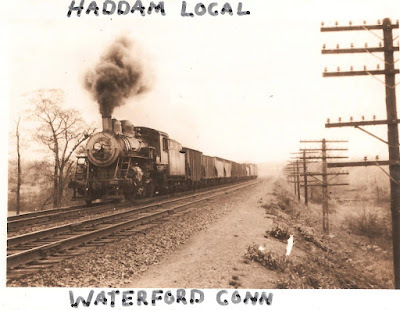 I would guess that between New London and East Haddam there were at least that many.